Retail sales of Mitsubishi's Outlander plug-in hybrid (PHEV) only commenced on 21 October in the Netherlands and it has immediately become the best selling car by a significant margin. 2,736 plug-in Outlanders were sold in November (from a total of 2,766 Outlanders) accounting for a market share of 6.8%. The second highest selling car in the Netherlands for November was the Renault Mégane with 1,505. In EU guise the permanent electric 'Twin Motor 4WD' has a claimed maximum driving range of 824 km, electric only range of 52km, fuel consumption of 1.9l/100km, CO2 emissions of 44 g/km and a maximum speed of 170 km/h. Braked towing capacity is 1,500kg. The battery pack takes five hours to recharge using a standard European 230V/10A domestic supply but just 30 minutes (to 80%) using a quick charger to CHAdeMO standard. 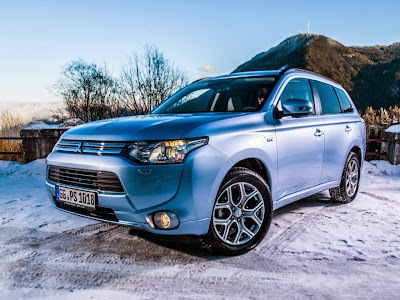 MMC insists the Outlander PHEV is neither "a mere adaptation of an existing internal combustion engine vehicle nor a dedicated plug-in hybrid EV system high tech showcase" but a further variant of the Outlander – alongside standard petrol and diesel versions "and developed as such from the start of the programme: a unique/no-compromise proposal in the industry and "the first self-power generating twin motor (permanent) 4WD PHEV". Mitsubishi said dealers had booked 10,000 signed orders across the continent since December 2012 and was "Much expected by dealers and customers in a region forecast to be its largest global market". The automaker expects EVs, hybrids and PHEVs to account for 20% of its production by 2020. If this trend of 99% of all Outlanders sold being PHEV continues, 20% might be a very conservative estimate.